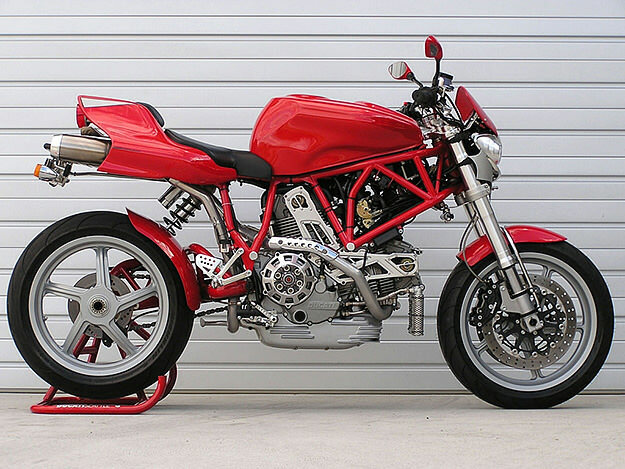 A few weeks ago, I read about this custom streetfighter on the Ducati Monster list. And then yesterday, a friend sent me a link to the same bike for sale on a New Zealand auction site. So I guess I should feature this stubby, purposeful-looking machine. There’s an interesting story behind it, starting with a riding holiday and a 200-hectare bush fire. The owner, Andi Delis, then got to work and fitted a modified tank and forks from a 900SS, dirt bike bars and integral mirrors/blinkers. An Acerbis Cyclops headlight completes the look, along with a hand-fabricated instrument panel and chin piece. The asking price for Malattia is just NZ$15,995—around US$10,500.